Submitted 1 year 7 months ago by Tatas Hardo Panintingjati Brotosudarmo. 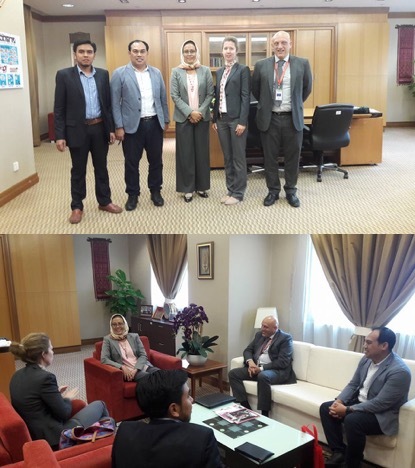 Putrajaya (12 September 2017) - Dr. Mohd Mustafa Al Bakri Abdullah, Chapter Country Representative for Malaysia arranged courtesy visit with Dr. Susanne Rentzow-Vasu (Regional Representative EURAXESS Link ASEAN, European Union Delegation to Singapore), and Alfonso Pino Maeso (Trade Section, European Union Delegation to Malaysia) to Datin Paduka Prof Ir. Dr. Siti Hamisah Tapsir, Director General, Higher Education in the Department of Higher Education of the Ministry of Higher Education Malaysia.